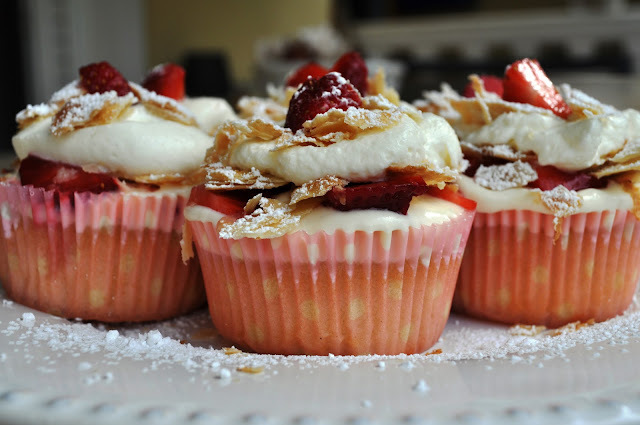 Sonia's Cupcakes: Strawberry Milles Feuilles (Napoleon) Cupcakes! 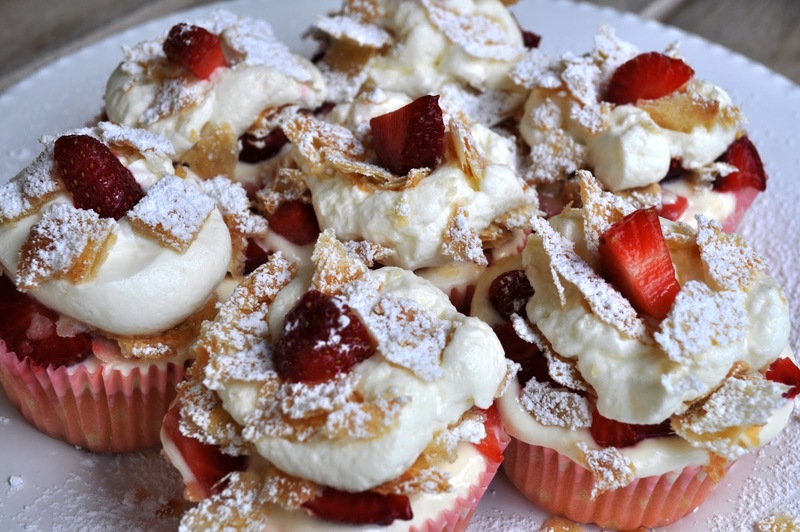 Strawberry Milles Feuilles (Napoleon) Cupcakes! God, I've been dying to make these for so long!! And Spring is the perfect time for it! First, one thing I'd like to say is that Milles Feuilles (Napoleons) in Greece are THE BEST outside of France! Believe me, growing up in NYC, this has been one of my favorite desserts, and I have had sooo many there....but it does NOT compare to the ones here. This is hard for me to admit as a New Yorker, but it's the truth! I think New York has very high standards when it comes to, well....just about anything!!! But this one is a winner. Back to my new invention! I wasn't sure that this was going to work out. 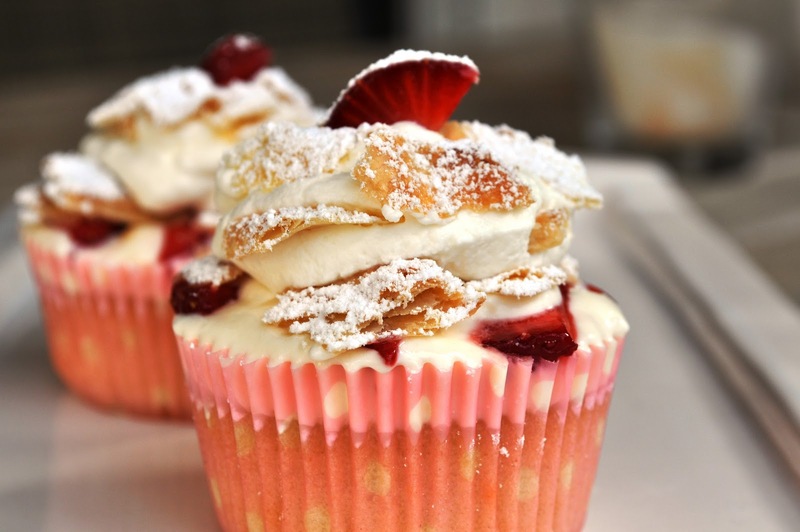 But, hey, just about anything has been made into a cupcake, why not a Milles Feuilles cupcake! I don't know what else to say, only that it turned out so much better than I ever imagined it would. It was insanely delicious!! Light, fresh and not too sweet!! This cake is very versatile; it goes with just about anything....and so easy to make! and here goes my favorite part! 1 cup of dry WHITE WINE! Beat sugar and eggs for about 30 seconds on medium speed with and electric mixer. Then pour all the other ingredients into the egg/sugar mixture and beat for another minute. That's all!! Super easy. Divide into prepared cupcake pans and fill a little less than 3/4 each one. You want to have some room on top to hold some of the pudding cream later. Bake for about 20 minutes or until a toothpick comes out clean. For the pudding cream.....this is where I have a hard time explaining since I've always made my own pudding without measuring for my kids. To make it easier, you can use ready made, or use this recipe I found and followed, but made some changes. I added an extra teaspoon, more or less, of Madagascar Vanilla. Please, please do not skip this step and use regular extract instead of either the vanilla bean or Madagascar!!! Trust me, I did it and had to do it all over again! It makes all the difference!! Then add about 2 1/2 cups of heavy cream, whipped with 3 tablespoons of sugar (more or less), to the pudding cream (or pastry cream...whatever you want to call it), and beat both, very briefly, until nicely blended. You will also need about an extra four cups of whipped cream for topping. You can make it the day before if you like. It's just Puff pastry already rolled out to thin strips and sprinkled with a little caster sugar. Bake it in a cookie sheet for about 7 minutes or until golden in 200 C or 400 F.
*Cut some fresh strawberries for topping and have some confectioner's sugar at hand for sprinkling. Cover cupcake with a layer of pudding cream....just enough so it won't spill out. 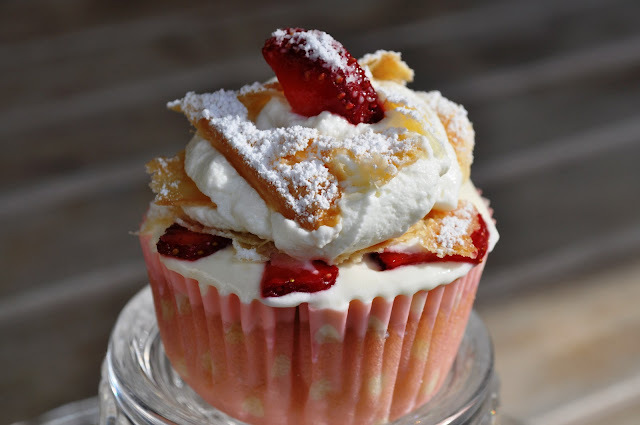 Place strawberries on it and top them with broken pieces of the puff pastry. With piping bag, add whipped cream, again more broken pieces of puff pastry and sprinkle with plenty of confectioner's sugar. A slice of strawberry on top to finish as you would do with a cherry on a Sundae. And there you have it! Hope I didn't make it too complicated! Really, it's not all that hard. If you prepare the pudding, puff pastry, and cupcakes ahead, then in the end it's just decorating it! Thank you Marina! They also tasted very GOOD!!! gorgeous!! wow I see you go all out when decorating your cupcakes. I like the white wine in a cupcake, have to try that!! love your blog. Thank you Lian! I checked your blog too and your sweets look delicious! Where do find the time translate everything?!!!! Thank you Valeria! Happy Baking! These are gorgeous! 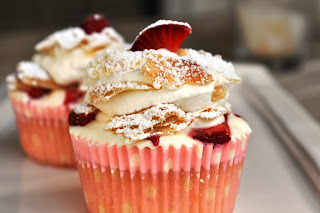 I love the idea of Milles Feuilles in cupcake form! Thank you Cupcake Princess! I just hope I explained the recipe well enough for everyone!! Little Miss Cupcakes! Please, let me know how it comes out!! I've playing with the idea of doing some vegan cupcakes myself...but when I do...I will start with something very simple. Thank you!! !